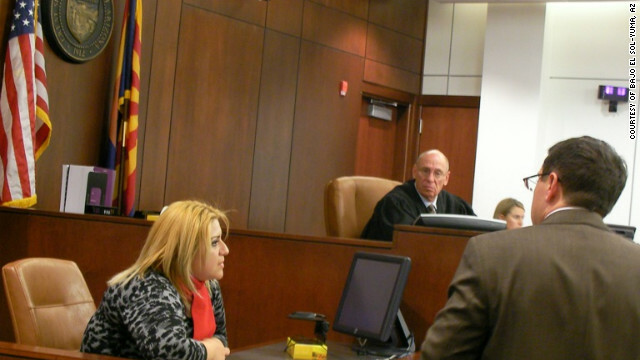 Alejandrina Cabrera answers questions about her ability to speak English in Yuma County Court. When Alejandrina Cabrera speaks English, it doesn't quite roll off of her tongue the way it does when she speaks in her native Spanish. Instead of the confident, strong way she speaks in Spanish to the residents of San Luis, Arizona, she speaks a bit more slowly, and perhaps with a bit less conviction, when she switches to English. That's something she admits, but she says that she can communicate at the level she needs to in English, given where she lives. In San Luis, 87% of residents speak a language other than English in their home and 98.7% are of Hispanic origin, according to 2010 U.S. Census data. After all, most of the people there, by all accounts, will speak in English and in Spanish. In the comfort of communal settings, they'll speak the way they're most comfortable. So why the focus on Cabrera and her language skills? Because when it comes to politics, it's a whole separate ballgame. And that's why a major debate about English proficiency has taken the town by storm. That's because when Cabrera threw her name in the hat to run for city council, Juan Carlos Escamilla, the mayor of San Luis, said he was concerned that she might not have the proper grasp of the language for the job. Escamilla filed a lawsuit in December that asked a court to determine if Cabrera's skills qualified her under state law to run for the council seat. The fight began as a purely political one, with opponents seeking to block her from running for office after she tried to recall Escamilla from office twice, according to The New York Times. But it has turned into a firestorm in a town where many constituents have the same grasp of English as Cabrera. The issues at the center of this debate: Just how much English must you understand to run for a political office? And what does it mean to be proficient? Those questions, and the political fight they stirred, led to a court hearing to determine whether Cabrera had enough of a grasp of English to be able to run for office. “I speak little English,” she told The New York Times in an interview, in a tone the newspaper described as a "hesitant and heavily accented." "But my English is fine for San Luis," she said. On Wednesday, a judge ruled that she didn't qualify to run for office based on her language skills, saying that Cabrera had "only a minimal survival range" in English. Yuma County Superior Court Judge John Nelson made the ruling after testimony from linguistics experts and Cabrera's own testimony, where she answered questions and read a few documents. Cabrera, a U.S. citizen who graduated from Kofa High School in Yuma, Arizona, was questioned on the stand about where she graduated, where she was born and what her name was. She was able to tell her lawyer her name and where she was born, but struggled with what school she had graduated from, according to the Yuma Sun. After being asked the question three times, without being able to answer in English, the judge allowed Cabrera to leave the witness stand and issued his ruling, the paper reported. Nelson said in his ruling that he wanted to make it clear that he wasn't saying that she had an "intelligence" issue, but it was because of her proficiency that he felt she should be removed from the ballot. CNN has reached out to Cabrera's attorney and city officials for comment. In 2006, Arizona passed a law that made English the official language of the state. Earlier, in 1910, Congress passed the Enabling Act, which allowed Arizona to become a state with certain requirements. Among them was one that addressed the English language. "The ability to read, write, speak, and understand the English language sufficiently well to conduct the duties of the office without aid of an interpreter shall be a necessary qualification for all state officers and members of the state legislature," a section of the act reads. But Cabrera's lawyers argued in court that her disqualification was truly unfair and may be unconstitutional, seeing as there is not an actual standard for a specific level of proficiency for a council candidate. It also leaves open many questions about the democratic process, among them: How far can you take the issue of proficiency? Would there be a problem if someone just had too thick of an accent for people to understand? Does it matter if a candidate can speak expertly with most of her constituents, who also may share a similar grasp of a language? And should it be a decision made by the courts, or should the voters be able to choose an elected official who appeals to them most, or choose to vote against her if they feel she can't grasp the language well enough? Should there be a test to determine English language proficiency? Does it matter if most documents and laws in the area are also provided in Spanish for residents to be able to understand? The issue is part of a growing discussion about the use of English in a land where people are from a variety of places. During a debate this week, GOP presidential candidates said that English should be the official U.S. language and should be the only language taught in schools. That's the stance of Bob Vandevoort, from the advocacy group ProEnglish, who said that if English were a standard in government, it would make the country more cohesive. "We are concerned as far as government goes, we don't want to see us become a multi-language nation, we want to see a nation that has one language as far as government is concerned," he said, adding that the language people speak at home is a different issue. But the climate is different in a variety of areas in the U.S., as multiple language and immersion programs pop up all over. Arturo Vargas, executive director of the National Association of Latino Elected and Appointed Officials, said there should be more opportunities to ensure everyone has the right resources to learn English. He said that in several cities, so many people are trying to learn English, there are extremely long lines to get into classes. But Vargas says you don't necessarily need to have full English proficiency to run for office. "I think it should be up to the voters to decide what kind of representative they want," he said. "I don’t think it’s necessarily fair to not be able, to not allow someone to present themselves to the voters as a candidate because of their language abilities." "I think it doesn’t serve our democracy well when people are not given all the options that they have." So what do you think? Was the decision to not allow Cabrera on the ballot the right one? Or should citizens have the final say on who they think is qualified to represent them? Let us know what you think in the comments section below. I find it funny that she has not enrolled in some english classes, can't she understand she is in the United States. How much more of our country do they want us to give away to them? She's an American citizen. It's her country as much as yours. @deathwombat Well since she is an American citizen, she should respect the country that gave her freedom and learn the language of the majority of the rest of the country. English. I say good for the judge - if you are an American citizen then be an American and dictates to me that are proficient in the English language - the Hispanic population is the first group of people to come into this country that seems to, in large measure, refuse to accept English as their country's language - you want to be American, then adopt our language - speak Spanish to your family and friends, fine – but I as an American should not be required to learn Spanish to communicate with the people in my own country. If I went to Mexico then I would and should speak their language - but don't force your language down my throat - and, by the way, quit your damn littering - you may have turned Mexico into a waste land of trash, you don't need to do it to our country, too (just look at what you have done in the border towns of TX. How we forget that Hispanics were here hundreds of years before the West became part of the United States. They did not come to this country. They were already here. Having said this, the voters should have decided whether she was a capable candidate. @teo And the American Indians were here before the Mexican's. How far back do you want to take your irrational opinions? Back to the dinosaurs? I think that before you insult other people based on their lack of knowledge surrounding a language, you should check your own. "Clear" should be "clearly" in at least three cases and for goodness sake, use the right form of "their!" That is a third grade mistake. Why don't YOU go back to school and learn to speak/write English correctly? Also...yes, Native Americans were here first, but in different parts of the country. When the US annexed Texas and many other parts of the West, that was Americans moving in where hispanics were already established. So technically, you are again wrong. This law shows a profound lack of respect for the voters. I'm against placing almost any restrictions on who can run for office. America is supposed to be a democracy, so don't tell me who I can and can't vote for. In many countries there are diverse language communities but only one language for communicating i.e., French, German, Itialian, British English, Spanish, Portuguese, Greek, Turkish. That same standard must apply here in these United States or they will become these Dis-United States. Speak another language or do not spead at all in your private life. I believe it is a great concession for companies to give the option of Spanish on their telecommunication lines. As an English speaking American I just will not speak with someone from a foreign country for merchanise purchased here (specifically electroniscs). If I have difficulty understanding an accent on any other phone service I request an English speaking person. I can understand how difficult it would be for other legislators to understand a poorly spoken accented person. Am I a racist, no I do not believe so. How can you defend her lack of proficiency in the English language when she, according to the article, could not say the name of the High School she graduated from? The simple fact that she would need to communicate with other political officials, who primarily speak English, emphasizes to the notion that she should be able to articulate her ideas for the community/area in both English and Spanish. How is it possible she graduated from High School and can't speak english? so she won't represent the english speakers of her community. this sounds fair, let's have all politicians do this. So if you don't speak english and your representatives don't speak spanish you won't get represented. sounds fair to me. Can we just make english our official language already? It's always the spanish representatives fighting against this. Sorry Lady. This is the United States and if you want to live here, learn to speak, read and write the language, specially if you want to hold office. If not, go back to Mexico! You go back to Europe! Did your ancestors learn the local Native American language when they moved here?